Ring Wars Carolina: Next Event: RWC Presents "Fatal Attraction"
Once brothers from a different mother and now enemies! Flex Simmons went on to become The Future of Honor in Ring of Honor and Gem Stone became the RWC Jr. Heavyweight Champion. Flex back stabbed Gem Stone with his new friends, The Caribbean Tiger and Joseph Everheart. These 3 men have set their sites on The RWC Jr. Heavyweight champion and his mentor, The RWC Superstar Hangtyme. Ladies and Gentlemen, All these men were friends at one time. They all took different paths to get to the same destination. The train stops here! 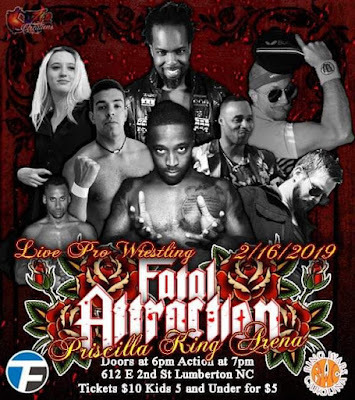 February 16, 2019 in the Priscilla King Arena located 612 2nd street Lumberton NC at 7pm! These guys are either gonna hug it out or Stomp it out, either way it's " Fatal Attraction!"